It’s been quite the summer for trail running with all the dry weather. The full loop at Chestnut Ridge has been dry since May and it usually takes until August for that to happen. I wanted to do a staff pick with a trail shoe since I lead the trail runs and love to talk about trails, but there’s just one problem. There’s more than one shoe I would pick that would be perfect for running the trails of Western New York. So, why not just talk about 3 shoes. Starting from left to right, the Nike Wildhorse 3 has joined my arsenal of running shoes. It has more cushioning than I expected which will make it better for longer runs. The rock plate works well protecting my foot from roots and rocks, but mostly roots since that’s the main obstacle you will find around here. The upper is soft and flexible allowing my foot to move. It’s a bit warm, but that will work well during winter runs in snow when trail shoes are doing double duty. The tread is not overly aggressive which is nice because I like to have some variation in my shoes. In the middle is the Saucony Peregrine 6 with EVERUN cushioning. There’s been some great improvements over the earlier version that I’ve used. The tread is aggressive, but its new pattern doesn’t hold on to the mud like in the past. The new wider toe box allows your feet to naturally splay. The EVERUN cushioning gives you an extra bounce because there’s more energy return compared to other cushioning systems. There’s so much good stuff going on this shoe. On the right is the New Balance Vazee Summit shoe. I’ll be honest and say that I haven’t ran in this one, but I’ve heard so many good reviews from our staff and customers about it. The shoe has a narrower fit and offers great foot protection. While it’s not the most cushioned trail shoe we offer, it could be perfect for a shorter to middle trail run or even a trail race flat. The best part is the price because it’s the most affordable trail shoe we offer. That’s a real quick review of some of our most popular trail shoes this summer. 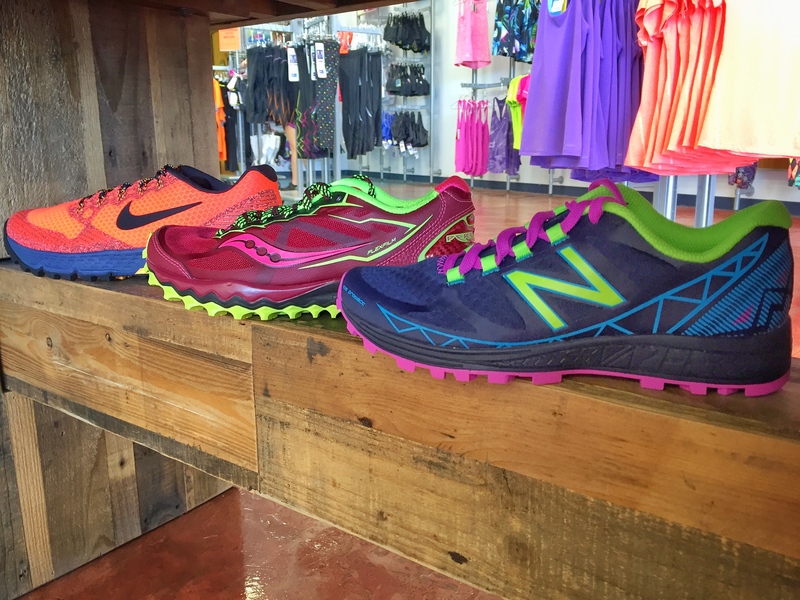 The autumn is the best time to run trails, so stop in today to get yourself some trail shoes.